Last night I saw a commercial on TV for the store Pac Sun. They have started a new ad campaign in which they encourage young people to “dress irresponsibly.” I had to look twice to see if that’s really what it said. At first, I was surprised to see a place that was so blatantly pushing for immorality. However, the more I thought about it, the less I was surprised. Our culture is becoming more and more comfortable with immorality. In fact, we have passed the point in which immorality is acceptable. It’s now encouraged. Modesty has become a large problem within the church. Like so many other problems, we have begun to allow the world’s standard to be our standard. A large part of this issue stems from the fact that everyone seems to have a different view of what is modest. For example, ask the question “how long should shorts be if they’re still going to be considered appropriate?” to 100 different people. 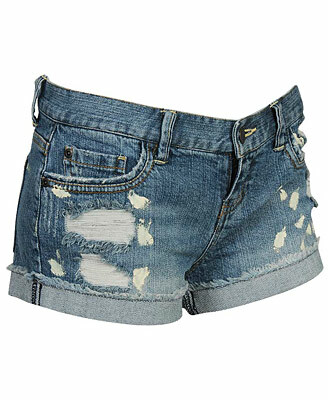 I guarantee you’ll hear everything from “they should come down past your fingertips” to “they should come to your knees” to “shorts really shouldn’t be worn at all.” That’s not even taking into consideration what the folks at Pac Sun would say. One reason we hear so many different answers when it comes to modesty is because the Bible doesn’t give us specifics when it comes to this issue. Don’t get me wrong; the Bible most definitely addresses the idea of modesty. We just don’t have passages that tell us how much skin is too much. However, that doesn’t mean that we are free to decide for ourselves what is appropriate. We still need to turn to God’s word. First, we know from passages like 1 Timothy 2:8-10 that there is such thing as immodest apparel. Now, that passage is referring to their culture and therefore we don’t expect women today to refrain from braiding their hair. However, the verse states that women should dress in “modest apparel.” We should expect ourselves to do the same today. Secondly, Romans 12:2 says, “Do not be conformed to this world but be transformed by the renewing of your mind.” This verse reminds us that the world’s standard cannot be our standard. While the owners of Pac Sun may see their clothes as perfectly acceptable, we as Christians hold ourselves to a higher standard. When it comes to modesty, if you find yourself dressing the same way that the world does, there’s a good chance you need to re-evaluate the way you dress. That’s not to say we should all wear turtlenecks and parkas. But if your standard for what is appropriate matches the standard of the world, something can’t be right. Finally, we need to remember that our actions can negatively affect others and their spirituality. Matthew 5:27-28 states that anyone who looks at another person with lust has already committed adultery in their heart. In Romans 14:13, we are told not to be a stumbling block for those around us. Each and every time we put clothes on, we need to consider these passages. Are we wearing something that could cause another person to sin in some way? Don’t fool yourself into thinking that no one might look at you in a lustful way. While we cannot completely control how others behave, we need to do everything we can to make sure we are not the cause for anyone’s sin. While this is nowhere near an in depth study of modesty, I hope it will at least get you thinking. This week, look at the clothes you put on and ask yourself whether or not it’s something God would desire you to wear. Being comfortable and evenly tanned is not our goal as Christians. This summer…dress responsibly. This entry was posted on Wednesday, May 25th, 2011 at 8:40 pm	and posted in Evangelism. You can follow any responses to this entry through the RSS 2.0 feed. AGREED!! I will be teaching the girls a lesson focusing on how we dress in the next few weeks! Thanks for giving me some great material!